I found this saying on the web and thought it was totally inspiring and awesome, so I made a nice printable quote in Illustrator for you all! This quote was inspiring because in my life, other years may have been disappointing or I didn’t get where I wanted to be, but this year, I am inspired to take charge of my life and work hard for the kind of life I want. I will work hard to be stronger in the face of struggle, I will be braver when hardships come my way, I will be kinder to those around me, I will be unstoppable when it comes to my dreams. 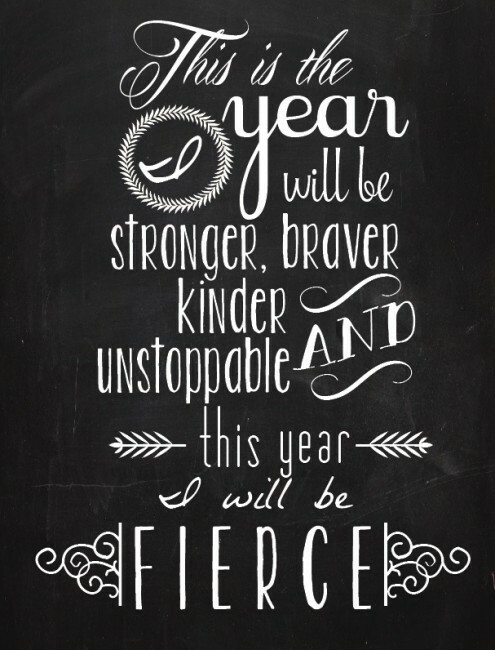 This year, I will be FIERCE! Click HERE for the free PDF printable and be inspired! I was wondering if I could get permission to use this image for our MOPS group, possibly on our T-shirts for this year? It fits perfectly with our theme for 2015-2016, “Fierce Flourishing”! Thanks for considering & nice work! Wonderful! Thank you! We will be more than glad to share a pic! Absolutely! I’d love it if you’d send a pic of you ladies in your shirts once they’re made so I can feature you on the blog! Thank you so much! I will make sure we do that! This is amazing! I too would LOVE to use this for our MOPS group… Is there any way I could change the background color to match our theme colors? Hi Erica! I love this design!!! I was wondering if I could use it on the back of our MOPs shirts this year? If so, is there any way to change the background/remove it and make the writing a black or other color? Thanks for sharing your creative abilities. Hi Holly! Thank you so much for your kind words! Please feel free to use it for your MOPs shirts! And if you send in a picture of your group in your shirts I’d love to feature it on social media 🙂 Unfortunately I don’t have much time to change the colors, but you are welcome to mess around with it and try to change the colors yourself! Hi Holly, I’m sorry I don’t seem to have the original editable PSD file any more since this was one of the very first printables I did when I started blogging 🙁 So it will probably be pretty difficult to change the colors etc. I wish I could be of more help! Perhaps another graphic designer will be able to offer some assistance? You can always just try the erase tool in Photoshop or Picmonkey and just carefully erase all the black. It would be time consuming, but it could work!